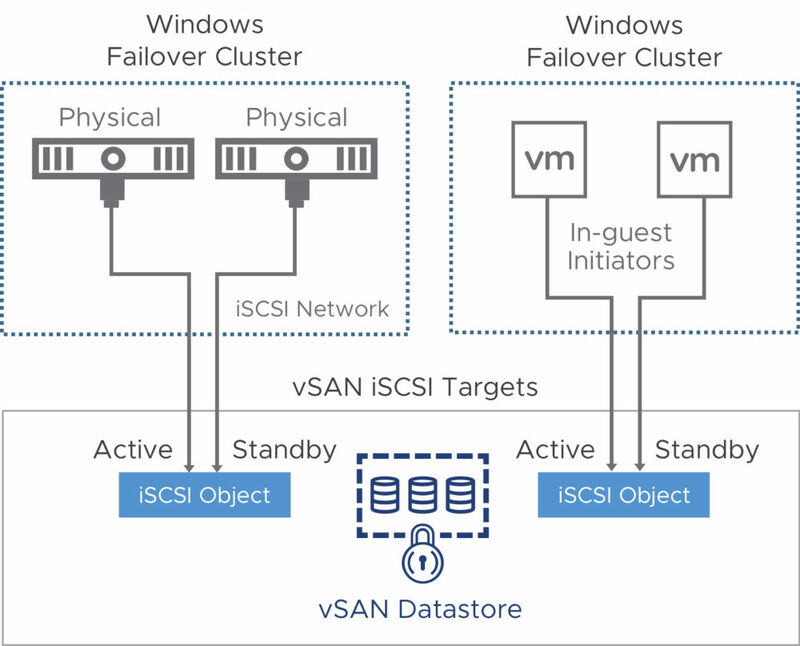 Few months back with vSAN 6.7 release, most awaited feature WSFC ( Windows Server Failover Cluster) with vSAN iSCSI Target Service was released. As part of vSAN, iSCSI Service was released in 6.5 and becoming more & more popular. As of this release, fully transparent failover of LUNs is now possible with the iSCSI service for vSAN when used in conjunction with WSFC. This feature is incredibly powerful as it can protect against scenarios in which the host that is serving a LUN’s I/O fails. This failure might occur for any reason: power, hardware failure or link loss. In these scenarios, the I/O path will now transparently failover to another host with no impact to the application running in the WFSC. In my earlier blog posts, I have already discussed about vSAN iSCSI target in depth with failover scenarios. Let’s begin with WSFC on vSAN datastore. With above screenshots, I hope you have clear picture of environment and will help in understanding further testing on this. Create iSCSI target and LUN based on the cluster role you will be using ( I am using file server and two luns at minimum is required, 5GB LUN is acting as disk witness and 10GB LUN is available for storage). Install Failover cluster and MPIO on windows node. Enable iSCSI initiator on both the windows node and discover target portal. Create heartbeat network for node internal communication. 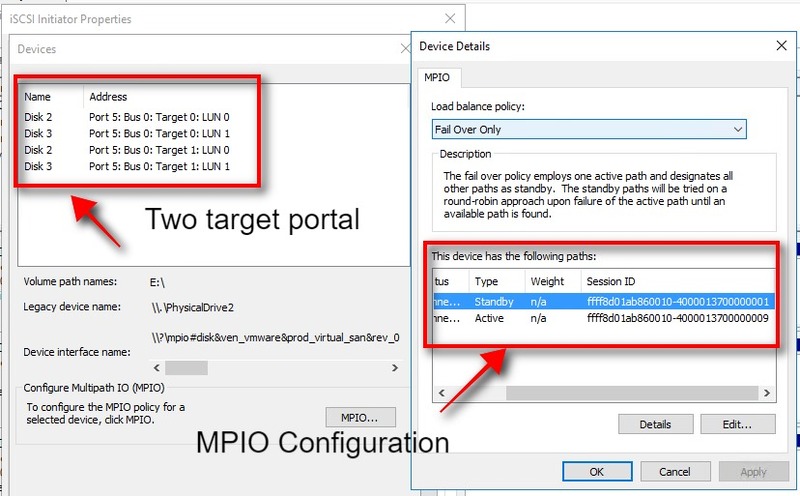 Configure MPIO and validate failover cluster. Create failover cluster and add the fileserver role. Create SMB share and map it with workstations. WSFC functionality majorly depends upon diskwitness and in our environment lun0 is serving as diskwitness. As you know diskwitness is quorum or tiebreaker. Let’s simulate failover and check how does wsfc nodes react and what happens at client end. In order to simulate this, I am starting copy process in client computer from one network drive to sharedrive and reset the IO target portal which is serving both the luns. In this screenshot, it is shown that wsfcp is the owner node for quorum and storage in windows cluster. wsfcp is acting as active and wsfcs is passive. iSCSI initiator has been configured with MPIO and MPIO settings are as per below. We have added two target portals with each 2 luns ( lun0 & lun1). Initiator has sessions with target portals and it’s been configured in failover only mode. One session is active at a time. If active session ( target) goes down, standby will take it over. So far, we are clear that IO Target is blr3 and this target has a session with initiator. This session is active and serving LUNs access. We need to see if this target bl3 goes down, how would nodes tolerate failure. Hence, I have started the copy process in client workstation and this will tell us how seamless the under-hood fail-over is. Copy process continued and finished. Now, lets look at the errors in windows nodes. 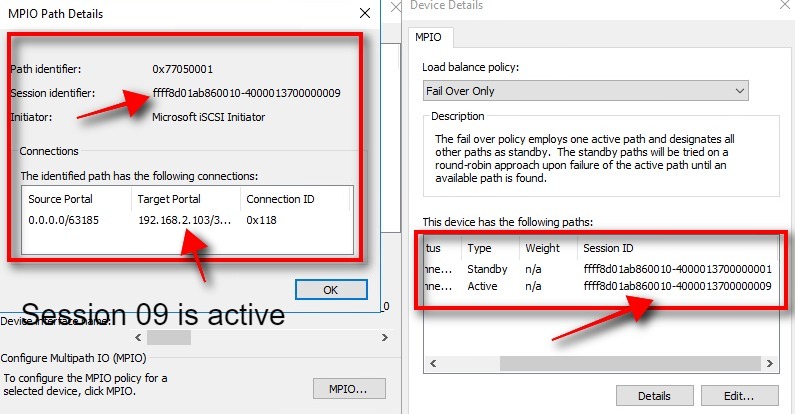 Below screenshots from event viewer shows that initiator failed to connect to target blr3 as it failed and based on MPIO configuration initiator is trying to connect to another target by making it active from standby. Request then transfers to target owner via iscsi direct.